Queen Elizabeth and her husband, Prince Phillip, pose for a portrait marking their 70th wedding anniversary on Nov. 20, 2017. 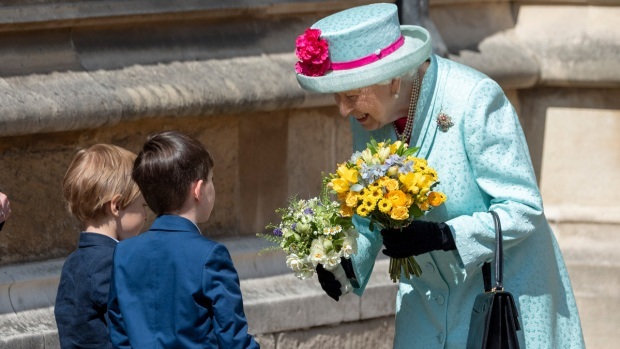 Britain marked the 70th wedding anniversary of Queen Elizabeth II and her husband Prince Philip on Monday with a peal of bells, a set of portraits and some commemorative stamps. The then-Princess Elizabeth married naval officer Lt. Philip Mountbatten at Westminster Abbey on Nov. 20, 1947, in a Britain physically and economically ravaged by World War II. Wartime Prime Minister Winston Churchill described the ceremony as "a flash of color on the hard road we travel." Elizabeth became queen in 1952. Now 91, she is the first British monarch to reach a platinum anniversary. Philip, who is 96 and also holds the title Duke of Edinburgh, has spent the ensuing decades supporting his wife in her role as head of state. At their 50th wedding anniversary, Elizabeth praised her husband as "quite simply... my strength and stay all these years." The royal family is reportedly holding a gathering at Windsor Castle to celebrate Monday's anniversary. The royal couple has four children, eight grandchildren and five great-grandchildren. The Royal Mail has issued a series of commemorative stamps. And at Westminster Abbey, bell-ringers sounded a full celebratory peal — lasting more than three hours — in tribute.